Biofouling and ballast water can introduce new marine pests and diseases to Australia, or spread ones established interstate to South Australian waters. Marine pests are virtually impossible to eradicate once established. Marine pests are usually highly adaptable, multiply rapidly, compete with native species and devastate the environment. Marine pests can also be hosts for infectious and notifiable diseases. Together these factors mean that marine pests threaten the sustainability of South Australian coastal industries, commercial and recreational fishing, aquaculture, tourism and the health of the marine environment. 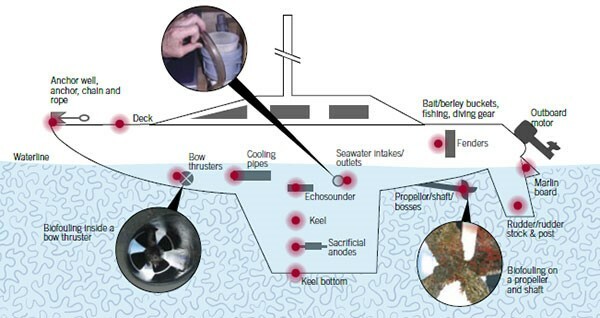 Vessel owners can help prevent the spread of established marine pest species and diseases by having good vessel cleaning practices in place and managing their ballast water. It is important to adhere to the relevant guidelines and understand your obligations. Biofouling, or fouling, is the accumulation of aquatic microorganisms, algae, plants and animals on vessel hulls and submerged surfaces. anti-fouling and in-water cleaning guidelines. Over 250 exotic marine organisms have been introduced into Australian waters by vessels of all types, from yachts to commercial ships. Up to 75 per cent of these are likely to have arrived as biofouling organisms attached to the external and internal surfaces of vessels. Clean hulls before leaving for new destinations to reduce the risk of marine pests spreading to other areas through vessel biofouling. Regularly inspect and clean areas prone to biofouling. Check areas including internal sea water systems, anodes, docking strips, sea chests, pipe openings, propellers, shafts and rudders. It is not just boat hulls that can harbour pests. Remember to dry and or maintain your equipment. Allow your boat 48 hours to dry and remove entangled seaweed and other organisms from ropes, anchors, buoys and other equipment. Apply or re-apply suitable antifouling coating to the hull and cavities exposed to seawater before the coating’s lifespan expires, particularly for boats that remain in the water for extended periods. Western South Australia (PDF 604.8 KB). A biofouling management plan and record book should also be consistently maintained as a measure to minimise biofouling. This document should meet all requirements under Appendix 2 of the Guidelines for the Control and Management of Ships’ Biofouling to Minimize the Transfer of Invasive Aquatic Species (PDF) (2012 edition or as amended). protection of our marine and estuarine environments for future generations. Image credit: Department of Agriculture and Water Resources. Marine equipment should also be regularly cleaned, particularly prior to moving to a new area (e.g. fishing gear, aquaculture equipment, boat anchors, ropes and buoys). View the Cleaning marine equipment fact sheet (PDF 175.7 KB). Ballast water is water carried in a ship’s ballast tanks to improve stability, balance and trim. It is taken up or discharged when cargo is unloaded or loaded, or when a ship needs extra stability in foul weather. When ships take on ballast water, plants and animals that live in the ocean are also picked up. Discharging this ballast water releases these organisms into new areas where they may become marine pests. There are legislative obligations to manage ballast water under Commonwealth legislation and requirements in relation to the management of ballast water and ballast tank sediment. These apply in all Australian waters. It is illegal to bring noxious species or notifiable aquatic pests and diseases into South Australia, and/or release or deposit exotic species into any waters. Offences exist under the Fisheries Management Act 2007 and Livestock Act 1997, and penalties of up to $250 000 for a body corporate or $120,000 for individuals may apply. PIRSA may also order a vessel known to carry exotic species (including noxious species) out of state waters or immediately out of the water to be cleaned if it poses a risk to South Australia. The state’s Chief Veterinary Officer can also order a vessel to be cleaned or ordered out of state waters if a notifiable disease is suspected or confirmed. Commonwealth legislation applies to the management of ballast water. South Australia’s Environment Protection Authority (EPA) also has in place recommended practices for biofouling and ballast water. View the Code of practice for vessel and facility management (marine and inland waters). The Code of Practice is designed to assist users to comply with their general environmental duty and fulfil obligations under the Environment Protection Act 1993 and related environment protection policies. within or adjacent to the state waters of South Australia.